Hand Crafted in Youngstown, OH. "Simply the Finest Quality Displays offered anywhere". O-Scale 15 - O-Scale Train Case. Dimensions - 24" tall x 35-7/8" wide x 3-7/8 deep. Shelf Size - 4-9/16"H x 35-7/8" wide x 3-7/8 deep. American made Crystal Clear & Mirrored Acrylic. Clear Body & Door along with Mirror Back allow for easy viewing of entire Car from any angle, even in low light. Welded Construction (NOT Glued) , Lighter and Much Stronger than glass. Hinged Acrylic Door keeps Cars Safe & Clean. Ready to Wall Mount - Quick & Easy. 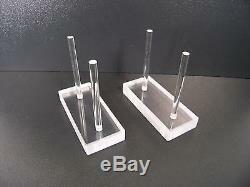 New Display Case Stands Turn your Display Case into a Free Standing Display Instantly! Material & Craftsmanship - Always Guaranteed 100%. NO Worries, NO Hassles - If you find a defect in in the material or craftsmanship of your display we will Replace it. Packaging - We use Double Walled 200# Crush test Card board boxes with Full Over Lapped Flaps. Plus we have our own Protective Foam Pads made specifically for each size & scale of Display Case we Make. Yes this is Very Costly to Us, but it's the only way we can be confident that you will receive your Display Case in Perfect Condition. Western Europe, South America, Australia, Japan - United States Postal. Before you place your order. PO Box within 48 contiguous states - Additional rates may apply. It's not uncommon for you to receive tracking information before it actually leaves our facility. Factory Direct - For us does NOT mean from a factory in China, it means from the hands of our skilled craftsman in Youngstown, OH... Thru Friday 8am to 4:30pm Eastern. Why are Carney Displays considered the Best? Experience - In 1986 Carney began experimenting with different designs for display cases for 1/24 scale plastic model cars & Hot Wheels. By the early 1990's the original 21 car NASCAR diecast Display case was a huge hit. Followed quickly by numerous popular designs in ALL Scales and Sizes. Although now known Worldwide as the makers of the highest quality acrylic display cases, Carney Plastics is still a small family owned and operated fabrication shop. Many of our fabricators have 20 or more years experience at plastic fabrication. Your Display Case will be considered "Top of the line" for as long as you own it. Longevity - The number of companies and individuals who have come and gone since 1986 is too numerous to count. Carney Plastics continues today & will continue tomorrow to bring you your favorite styles, as well as innovative new styles for new collectibles. Carney products are always EXCEPTIONAL! Many More Styles & Sizes Here. Brillianize Brand Plastic Cleaner & Polish. Cleaner & Anti Static Polish, Good for ALL Plastics. We will be happy to direct you to them for the best service & pricing. If you've ordered the Wrong Display. You can return the Display Case to us within 30 days. Please Don't hesitate to ask us questions BEFORE you order. We are Always Happy to Help you choose the Perfect Display Case! Yes this is Very Costly to Us, but it's the only way we can feel confident that you will receive your Display Case in Perfect Condition. It is extremely rare for damage to occur - But it can happen.. Postal We will make ALL the Return and Replacement Arrangements, so you do NOT have to. We will give you detailed instructions including: A return authorization #, and where, when the display will be picked up. Products Displayed In Case are NOT Included. The item "Train 15-O Display Case" is in sale since Wednesday, August 12, 2015. 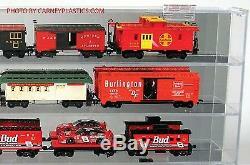 This item is in the category "Toys & Hobbies\Model Railroads & Trains\Storage & Display". 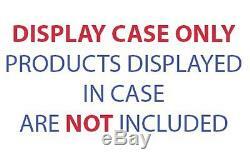 The seller is "displaycasedirect" and is located in Youngstown, Ohio. This item can be shipped to United States.